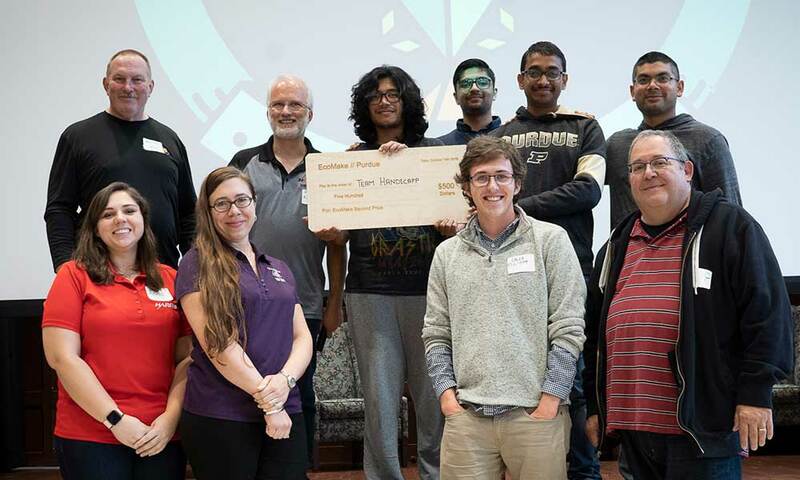 Purdue faculty and staff constantly encourage students to get involved around campus, and one great new way to get involved this year was EcoMake weekend, an engineering and design competition centered on sustainability. Student teams of 3-5 have 54 hours to design, create, and then present a product that in some way contributes to environmental sustainability. 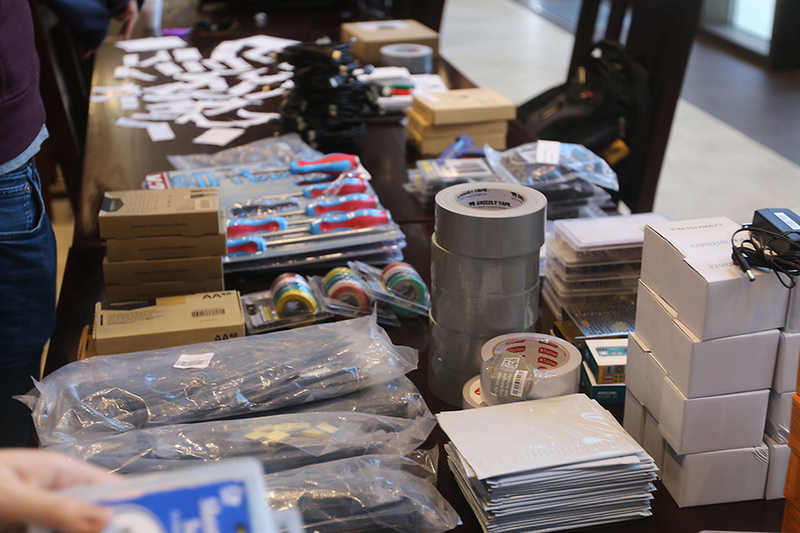 All resources, such as 3D printers, laser cutters, microcontrollers, sensors, circuitry, and more, are provided, and students just need to let their creativity and innovation shine. 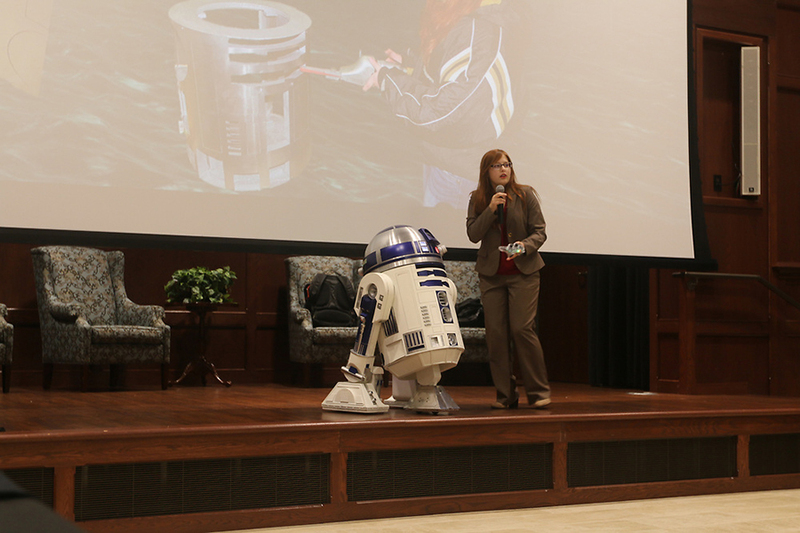 Freshmen Electrical Engineering student Alexandra Forsythe gives a presentation over the fully operational R2D2 she constructed. Participants listen attentively to a presentation given by Alexandra Forsythe. 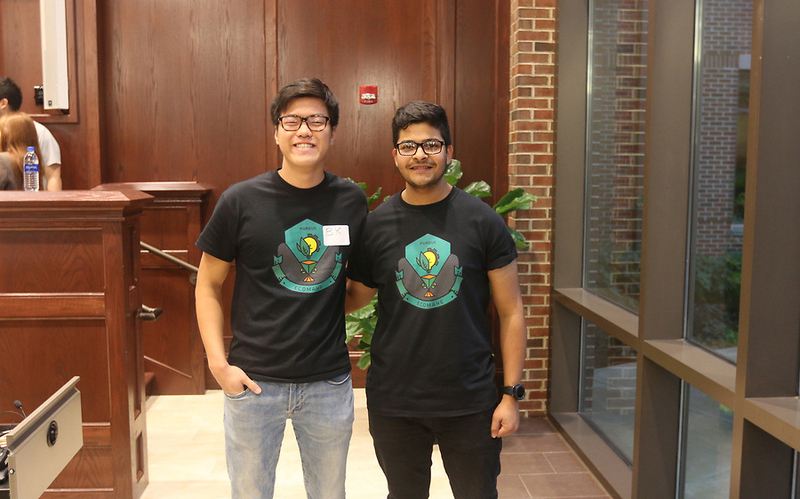 The competition’s founders’ Yash Gupta and Byeonghun Kim (BK) had the idea when they noticed a gap in the amount of sustainability initiatives that could’ve been taken and a lack of Purdue Engineering’s involvement. Yash Gupta and Byeonghun Kim pose before kicking off the weekend. 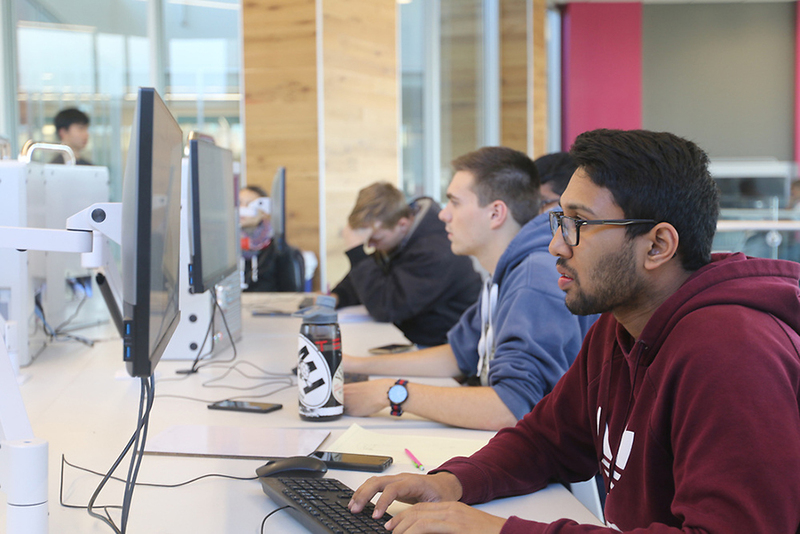 “We saw this gap and decided to create something special to potentially fill it,” said senior computer science major Gupta. The competition is very special indeed, as it is the only design competition in the Midwest centered on sustainability. Not only is it an environmentally focused design competition, but there is also an entrepreneurship aspect as well. A Harris Corp. representative discusses potential product improvements with students. 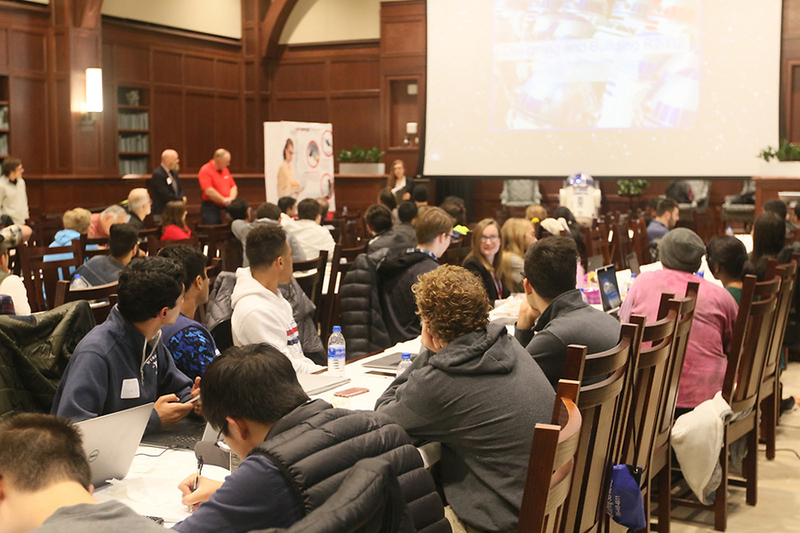 “Corporate sponsors such as the Harris Corporation and MK Technologies sent representatives to serve as mentors and recruiters throughout the weekend. Representatives initially gave presentations about issues they experience as well as how to go about solving them. 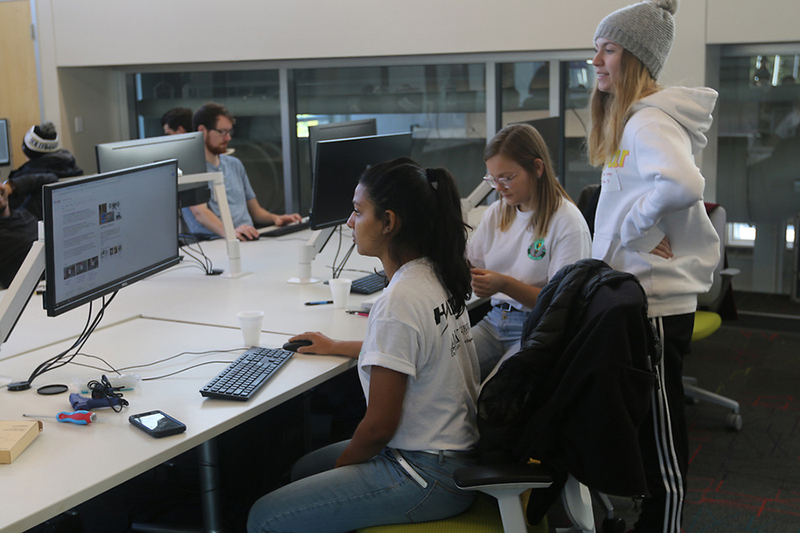 Students could then bounce ideas off the reps about how to further improve their products as well as pursue internships or employment throughout the rest of the weekend. 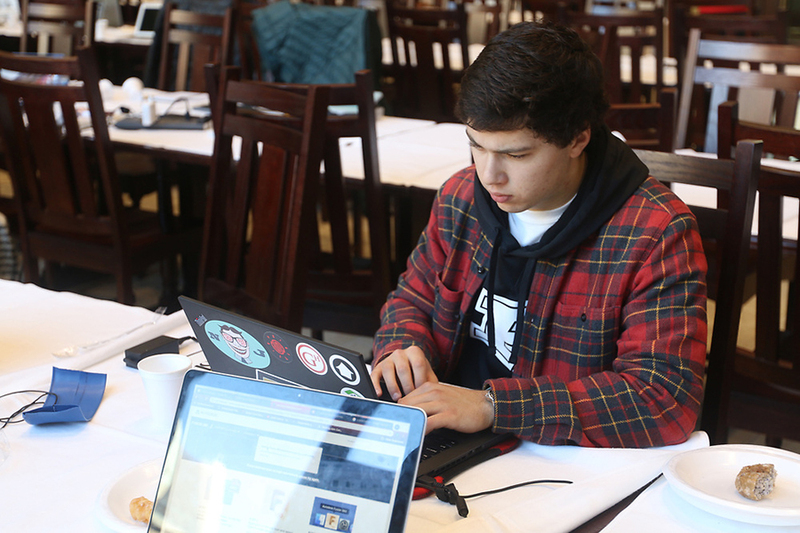 “Our sponsors didn’t just support us financially, but they provided a great resource for students to succeed in the competition and potentially network for future employment,” said Gupta. 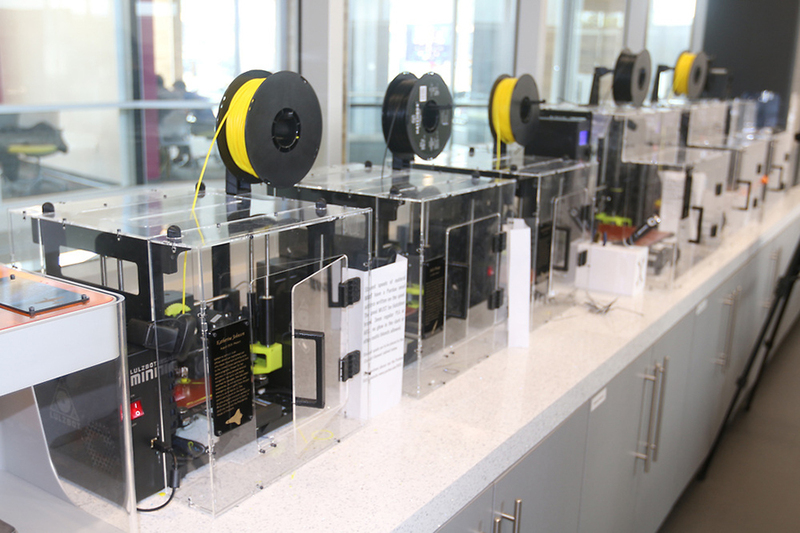 The Bechtel Innovation Design Center's array of 3D printers available to the competitors. The rules of the competition are very simple: design and create a product that in some way contributes to environmental sustainability. Products will then be judged on their innovativeness, relevance to sustainability, functionality, and the team’s presentation of the product. The winning prize was $1500, and all teams get to keep their finished product. Purdue students from any major, not just Engineering, could apply to enter the competition with applications being judged on a student’s ability to demonstrate design initiative. Accepting all majors was important to the founders because the technologies used apply to numerous fields outside of engineering. This year 110 students participated, and there are hopes of expanding that number greatly for future EcoMake weekends. With so many participants in the first year already, there was sure to be a wide range of brilliant ideas. Brilliance was definitely on display with this year’s winning team who designed an automated soil tilling machine that reduced the current amount of time and energy used to till land. While some might think this is a small feat of engineering, the impact is much greater than that. It has the potential to save farmers millions of dollars and reduce emissions to our environment. Junior MDE Karuna Srivastava works on the computer with her team to perfect their innovative keyboard. 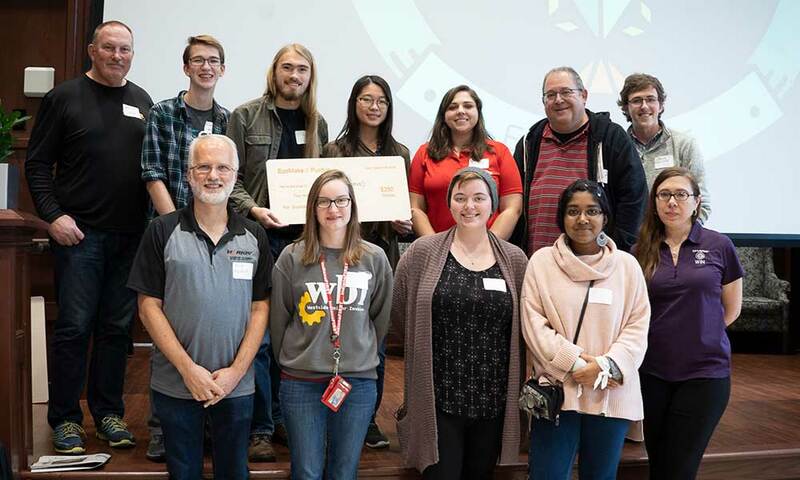 Great ideas didn’t just stop at first prize as junior multidisciplinary engineering student Karuna Srivastava and her team designed a keyboard that produced energy while typing. The keyboard was intended to convert the kinetic energy from typing into a usable form which charges a battery. Ideas like these are exactly what was envisioned when the event was founded. Students were meant to use their knowledge to create beautifully innovative products that could help make our planet more sustainable. “It’s really cool being able to apply everything I was learning in class and labs to creating a functional product,” said Srivastava. Junior Agricultural Engineer Trey Ladyman works on his computer to refine his irrigation hose design. 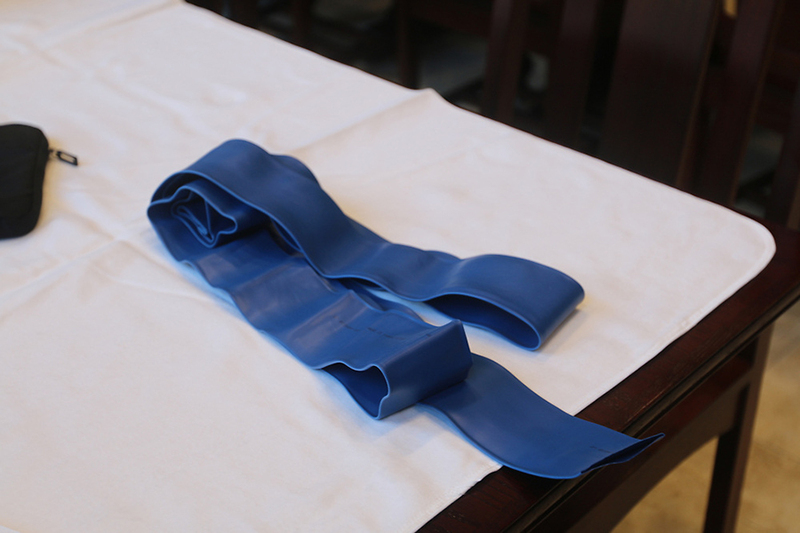 Another student used his skills acquired in Agricultural and Biological engineering to develop new irrigation hoses that reduce waste. 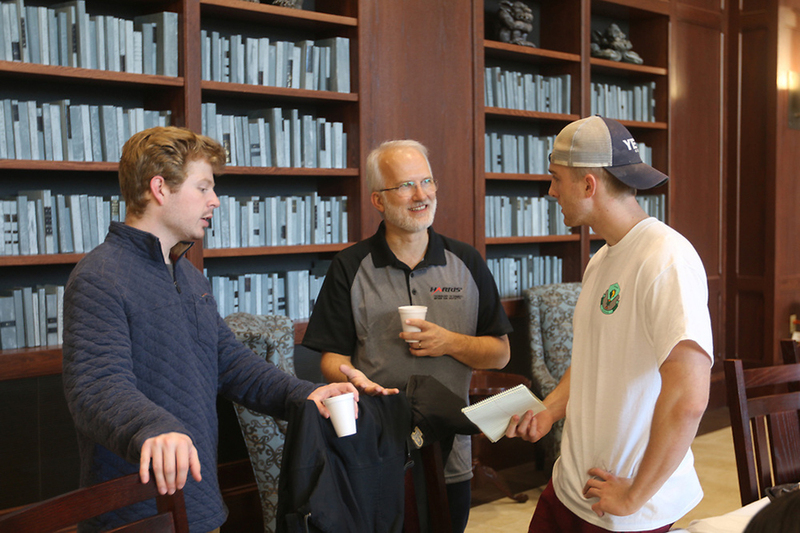 “Each year hundreds of acres of plastic waste are generated from irrigation hoses that cannot be reused, so we decided to design an irrigation system where the hose was made from a sturdy, reusable material,” said Junior Trey Ladyman. Even though Ladyman and his team did not win, they at least had fun doing it and can potentially make an impact on our planet with their product. Senior Computer Engineer Johnny Li's forest fire sensor. 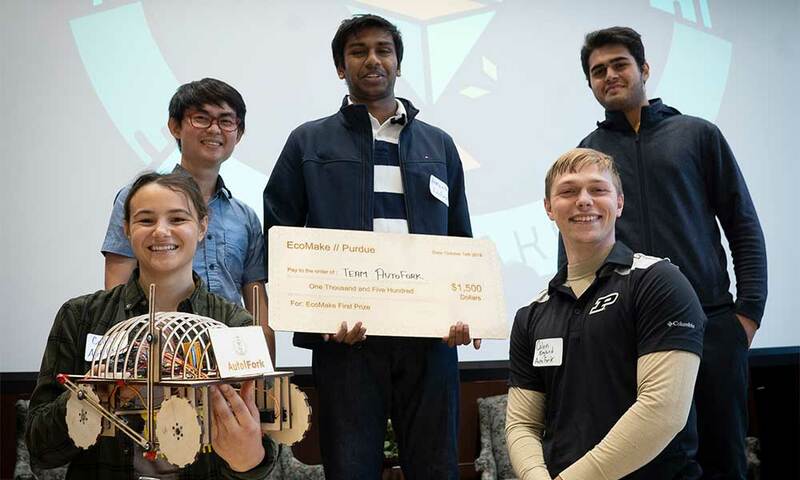 The EcoMake design competition truly showcased some of the best innovators Purdue has to offer. It’s a great way for students to get involved, have fun doing meaningful work, and gain valuable real-world experience applicable to various industries. Whether students win the competition or not, their ideas and innovation could be used to change the world one day. Example of current irrigation hose, which is wasted each year. The parts table where students could pick what materials they needed for their products. Junior ME Akshay Rao works on his smart rain barrel design in the Bechtel Innovation Design Center. 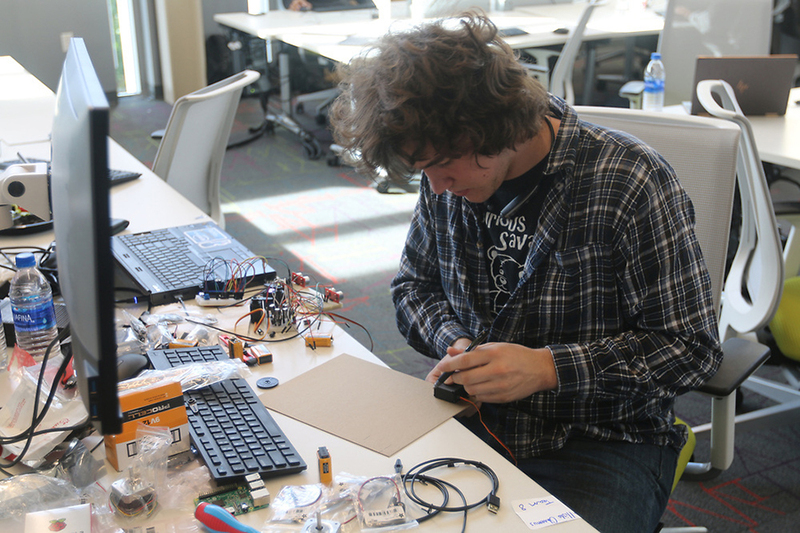 Sophomore Mechanical Engineer Tony Kramer works on a circuit for his product in the Bechtel Innovation Design Center. 2nd place: Team Handicapp, $500 prize. 3rd place: Team Batcave, $250 prize.